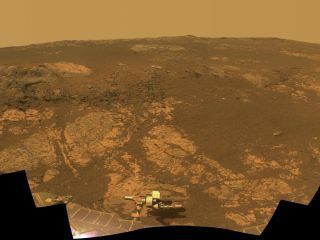 As NASA's Mars Exploration Rover Opportunity neared the ninth anniversary of its landing on Mars, the rover was working in the 'Matijevic Hill' area seen in this view from Opportunity's panoramic camera (Pancam). Images for this mosaic obtained Nov. 19 to Dec. 3, 2012. The older, smaller cousin of NASA's huge Mars rover Curiosity is quietly celebrating a big milestone today (Jan. 24) — nine years on the surface of the Red Planet. NASA's Opportunity rover landed on Mars the night of Jan. 24, 2004 PST (just after midnight EST on Jan. 25), three weeks after its twin, Spirit, touched down. Spirit stopped operating in 2010, but Opportunity is still going strong, helping scientists better understand the Red Planet's wetter, warmer past. "No one could've imagined how good the exploration and scientific discovery would be for this vehicle, looking from the perspective of nine years ago," said John Callas, Opportunity's project manager at NASA's Jet Propulsion Laboratory in Pasadena, Calif. "It's been a phenomenal accomplishment." The headline-stealing Curiosity rover, for its part, touched down on Aug. 5, 2012, marking the next step in Mars exploration. The car-size Curiosity weighs about 1 ton — five times more than either Spirit or Opportunity. For example, in 2007 Spirit uncovered an ancient hydrothermal system in Gusev Crater, suggesting that two key ingredients for life as we know it — liquid water and an energy source — were both present in some parts of Mars long ago. And Opportunity is currently inspecting clay deposits along the rim of Mars' huge Endeavour Crater. Clays form in relatively neutral (as opposed to acidic or basic) water, so the area may once have been capable of supporting primitive microbial life, researchers say. "This is our first glimpse ever at conditions on ancient Mars that clearly show us a chemistry that would've been suitable for life at the Opportunity site," Opportunity principal investigator Steve Squyres, of Cornell University, said of the discovery at a conference last month. The rovers rolled far beyond their 90-day warranties. Spirit finally stopped communicating with Earth in March 2010, after getting mired in soft sand and failing to maneuver into a position that would allow it to slant its solar panels toward the sun over the 2009-2010 Martian winter. NASA declared the rover dead in 2011. But Opportunity keeps chugging along. It has put 22.03 miles (35.46 kilometers) on its odometer since landing on Mars — just 1 mile (1.6 km) off the all-time record for most ground covered on the surface of another world. The Soviet Union's unmanned Lunokhod 2 rover holds that mark, traveling 23 miles (37 km) on the moon back in 1973. The great engineering that allowed Spirit and Opportunity to keep roving for so long is a big part of the six-wheeled robots' legacy, mission team members say. "These are magnificently designed machines," Callas told SPACE.com. "We really have greatly expanded the exploration envelope by having a vehicle that can not only last so long but stay in very good health over that time, such that we can continue exploring." While Opportunity is showing signs of its advanced age, such as an arthritic robotic arm, the rover remains in good shape overall. "Its health right now is miraculously good," Callas said. Still, the rover team is treating every day as a gift at this point, knowing that Opportunity could conk out at pretty much any time. Indeed, the sun will rise one day without a message from Opportunity, and its handlers will have to face the rover's death and the end of an amazing mission. "It's going to be hard; it'll be the end of a great era," Callas said. "But we'll have to remember that we've had such a good run."